If all goes well, when a scientific paper is published and the media pick up on the story, a lot of effort gets boiled down into a soundbite. New cure for cancer discovered. Water found on Mars. Fish stocks disappearing from the world&apos;s oceans. This focus can be a good thing for communicating science to the public, but it masks a lot of what was necessary to produce that result. Often, the story of how, and why, science gets done is as interesting and important as the actual result. Indeed, the decisions about what does not belong in the soundbite are as critical as the decisions about what does. We&apos;ve all heard about aha! moments or the apple falling on Newton&apos;s head. Most of the time, the story is much messier than that, but also often more compelling. This is the first in a series of stories in which we will explain, explore and expose the process of science — as it is happening — for a large, collaborative, international project to develop a single composite measure for the health of the world&apos;s oceans. The Ocean Health Index is trying to capture and synthesize how people benefit from marine systems and the ways that we interact with and affect ocean health — all in a single number. There are literally thousands of indices out there, and many of us have little idea how complex some of them are or even what they actually represent, even though we use them every day. Think about trying to fully understand and capture a nation&apos;s economy in a single number — that&apos;s the gross domestic product. But then others use a stock index — say, the Dow Jones Industrial Average — as a proxy for the economy. Both are single but different numbers that represent the health of the economy ; or trying to measure which college is the "best" — that&apos;s the US News & World Report rankings of colleges and universities. These are complicated indices that have many hidden assumptions and major challenges that had to be overcome for them to be calculated. An important first question about our project is why we are focusing on health. At first blush, it seems an obvious and easy measure — a healthy ocean is a good ocean, right? But what exactly does that mean? In general, when policymakers and the public use the phrase "ocean health," they are implying we need to think about the whole ocean, not just one or a few parts of it. That means whales and fish and mangroves and corals, but also crabs, seagrasses and fishermen and ship captains — and much more. 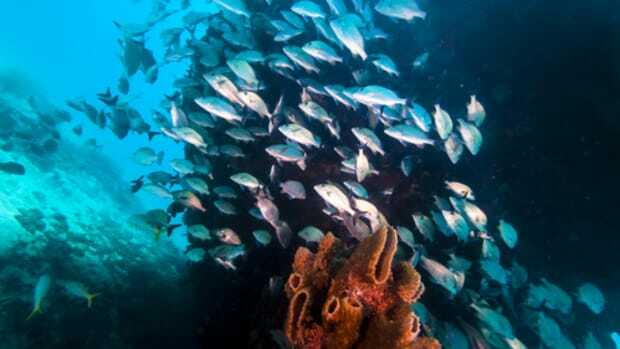 This perspective, dubbed "ecosystem-based management," has led to a focus on all the ways that people benefit from, and have impacts on, marine species and ecosystems. Providing the science to underpin such efforts is a tall order, not least because it is a rare situation in which all parts of an ocean can be managed to good standing at a single place at any one time. A booming whale-watching industry may come at the expense of thriving fisheries, while an emphasis on unpolluted waters may constrain coastal economies. As a consequence, it is no trivial task to answer the question: healthy to whom? Does a fisherman landing a record catch worry that the fish were harvested from increasingly warm and acidic ocean waters? Is a whale-watching tour boat operator concerned that coastal habitats that provide protection from storm damage are in decline? As in the political arena, Miles&apos; Law applies to ocean health: Where you stand depends on where you sit (sail, swim or seine). One of the major goals of our project is to confront this issue head-on: a healthy ocean takes on different meanings depending on which lens we use. The importance of different values pertaining to ocean health, and how different components of ocean health trade off, are two of the topics we will cover in this series. Before diving too much deeper into the details of the Ocean Health Index project, let&apos;s take a step back and say a little bit about who we are, how we got involved in this project and what we hope to achieve with it. Nearly 40 scientists from around the world, over a dozen communication experts, and several advisory and steering committees with policy and nongovernemental organization expertise form the core project team, and we are leveraging the work of hundreds of scientists who have done relevant work before us. We are three of the lead scientists for the Ocean Health Index project, and we each are affiliated with a very different organization: one an academic research university (University of California, Santa Barbara); one a research group at a federal agency (Northwest Fisheries Science Center for the U.S. National Oceanic and Atmospheric Administration); and one a nonprofit organization (Communication Partnership for Science and the Sea) that works at the intersection of science, policy and communication to connect science to the wider world. Each of us individually, and each of our organizations, is vested in defining and measuring ocean health from a more holistic perspective than has been attempted in the past. The rationale for doing so is to evaluate what is happening to individual and very different parts of the ocean (such as fisheries, water quality, and carbon-sequestering coastal habitats) without losing sight of how the ocean as a whole is changing from place to place and from time to time. The litmus test for the success of our efforts will be whether the Ocean Health Index helps policymakers and the public to make better decisions about what they get from, and leave in, the ocean. In so doing, we hope this project helps people avoid making unnecessary mistakes, such as sacrificing food security for biodiversity conservation where both could be served. We&apos;ve become involved with this project based on a feeling that alignment of our efforts from the get-go will produce a positive outcome more efficiently and effectively. The genesis of this project illustrates how both vision and serendipity drive the scope and direction of science, and also how science is an ongoing process that continually builds upon and adapts to previous work. Two independent efforts decided to tackle the problem of developing indicators for ocean health from very different perspectives and approaches. One effort was funded and motivated by philanthropistWilliam "Beau" Wrigley, who wanted to raise public awareness, guide international policy and protect the oceans by creating a single index that would help simplify and communicate extremely complex issues of ocean condition — in short, to create the Dow Jones of the ocean. He challenged the founding partners of the Ocean Health Index — Conservation International, National Geographic and the New England Aquarium — to make this vision a reality. A separate effort grew out of a meeting between legal experts and marine scientists, held at Stanford University in 2009, that ended with the challenge to develop a short list of indicators that could be used to describe how humans and nature can interact to produce healthy ocean ecosystems. A multiyear project was then funded by the Packard Foundation at the National Center for Ecological Analysis and Synthesis to bring together a group of experts who have been engaged with translating science into policy to tackle this challenge. Several people were part of both projects from the start, and about six months in, it became clear that the overlap between the two was substantial and that everyone would benefit from merging them. We now have a single project, but the elements of what gave birth to each of the parent projects remain intact and provide an interesting and important tension as we progress. Collapsing everything into a single number requires some important challenges to be overcome (we will cover these in future articles), and not everyone feels comfortable with the solutions to those challenges. But segregating the pieces makes communication harder and sidesteps the reality that people combine things in their head, anyway. So why not help them do that combination in a way that is transparent and faithful to the best available science? In the end, our project will allow for both goals to be met, but addressing this tension has added rigor (and no shortage of frustration) as we work toward the final product. The Ocean Health Index project is very ambitious and requires a lot of choices to be made to solve key challenges, and also a lot of new scientific ground to be broken. We anticipate that all the details and nuances that had to be overlooked to allow for global-scale assessments will not sit well with some people. This tension between precision and broadly comparable results is typical for an effort like ours, but this reality doesn&apos;t make it any easier to appease critics. • Raising awareness in the public about the health of the world&apos;s ocean. • Informing regional to national scale policy decisions about how we use and protect the ocean. • Catalyzing efforts to more sustainably use and manage ocean resources. This series of articles will reveal key background information, conversations and decisions that led to the current incarnation of the Ocean Health Index. Most exciting of all, we think, is that the Ocean Health Index remains a work in progress. As we advance toward its launch in February 2012, we will share with you our ups and downs as we work toward achieving these goals.